Renew, Reconnect, Refresh, Replenish was the overarching theme as the Order of the Most Holy Mary Theotokos – “The Old Catholic Marianists” assembled in Chapter 24–26 October 2014. We once again gathered for our 2014 O.SS.T. Synod / Retreat at the Immaculate Heart Center for Spiritual Renewal located in the foothills of Montecito, (Santa Barbara) CA, as a time for spiritual renewal, connected community, prayerful worship, and engaging dialogue. As Christians we are indeed called to be in relationship both with God and with each other. Without the relational element, any individual, much less any religious community and /or order, is bound to be weakened. Subsequently, relationships and community must be nurtured in religious life. The purpose of the annual Synod / Retreat was is to provide our membership the opportunity to gather from across the vast distances of the jurisdiction for worship, theological reflection, fellowship, networking, and spiritual renewal. Religious traditions always turn to something beyond simple survival, something meaningfully deeper, to fulfill the human need for purpose and meaning; human beings need a sense of community, belonging, and connection. The word religion itself is most likely derived from the Latin root religare, to “re-tie” or “re-connect”. Do we need to “re-tie” or “re-connect” with our sisters, with our brothers, with our Order? The Order of the Most Holy Mary Theotokos is about who we are as a community and what we are doing individually and collectively to build God’s kingdom. Sr. Joann and Dom ++Robert enjoying a chat before celebrating Sunday morning Mass in honor of Sr. Joann's retirement. Sister Joann Connors has decided to retire from her 34-year resident position serving the Center for Spiritual Renewal. She is scheduled to move to the Immaculate Heart Community Kenmore Residence on November 1. 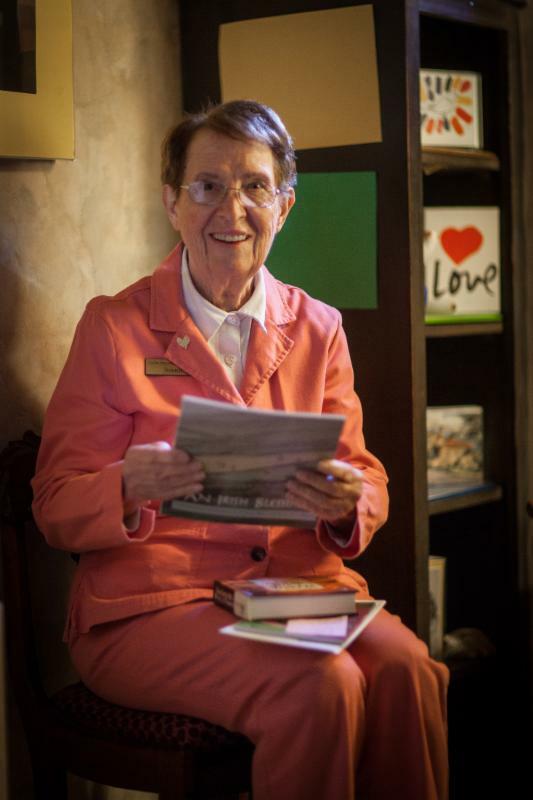 She will be settling into a room on the 2nd floor just across from her friend, Ann Chamberlin, another beloved Center resident of many years. The speed of this decision somewhat surprised us but we know it has been on Joann's mind for a while. It will no doubt be hard to give up her beloved home, the many people she has come to know, as well as all the various tasks she has been faithful to over the years. 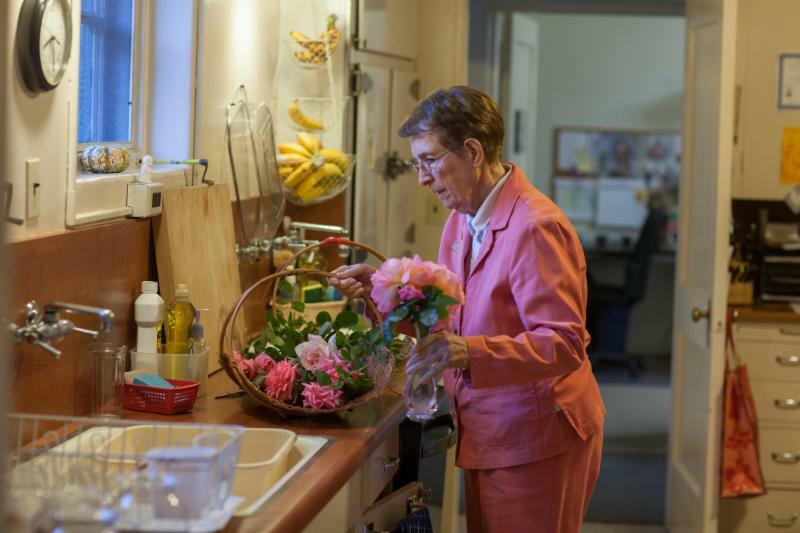 True to Joann's positive outlook on life, she realized that the four things she loves most - spiritual direction, caring for guests, leading prayers, and creating beauty - are all activities she can offer at the Kenmore Residence. Though a significant change, she is already geared up for the move with a feast of farewells underway. We consider ourselves fortunate that Sr. Joann’s final week at the Center coincided with our 2014 Annual O.SS.T. Synod / Retreat. To honor Joann's numerous contributions to the Center, her love and compassion to the thousands of guests she has greeted; we celebrated our Sunday morning’s Mass in her honor. As a way to offset how much Joann will be missed, the Center for Spiritual Renewal is planning to have her return every few months for a retreat week so guests who come regularly for spiritual direction can still arrange time with her. How the Center will fill the gaping hole of Joann's departure is a mystery! As those of us who have been touched by her smile and humor know so well, no matter who the next person might be, no one will ever be able to fill Joann's shoes or duplicate her amazing spirit of hospitality and grace. Our love, support and blessings go with her as does heartfelt gratitude for the joyful legacy she leaves behind. The Brothers and Sisters of O.SS.T.